On June 18, 1942, James Paul McCartney was born at Walton General Hospital in Liverpool, where his mother had previosly worked as a midwife. His brother, Michael, who's full name is Peter Michael McCartney, and who later went by the name of Mike McGear, was born eighteen months later. His family moved a few times, when he was 13, they moved to 20 Forthlin Road in Allerton, just across a golf course and a little over one mile away from where John lived with his Aunt Mimi. Music was always a part of the McCartney household. Before the war, Paul's father was a Cotton salesman during the day, and a jazz musician with Jim Mac's Jazz Band by night. 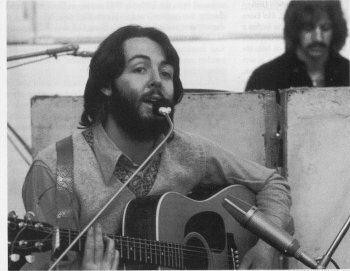 Both Paul and his brother received piano lessons. His mother Mary died of breast cancer when he was fourteen, while the two brothers were away at Boy Scout camp. The antithesis of John Lennon as a school boy, Paul did very well in school. When Lonnie Donnegan appeared in Liverpool and the Skiffle craze hit, Jim McCartney scraped together �15 for a guitar for Paul. Paul's friend Ivan Vaughan invited Paul to Woolton to see the Quarrymen play in Woolton on July 6, 1957, but not really to hear the Quarrymen, it was because Vaughan had promised Paul it would be a great place to pick up girls, which Paul was already very interested in at the age of 14. Later in the afternoon, after hearing the Quarrymen play, Paul borrowed a guitar and impressed the boys with all the chords and the words to "Twenty Flight Rock". Paul's first impression of John was that he was drunk. But Paul wrote down the words for "Twenty Flight Rock" and "Be Bop a Lula" for him so that John could learn them. A few days later Pete Shotten told Paul the others wanted him to join the band. Paul switched to the Bass when the Beatles' bass player Stu Sutcliffe left the group in 1961. 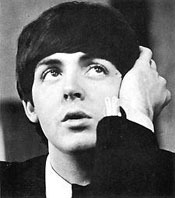 Paul soon joined the group and, along with John, became its principle songwriter. 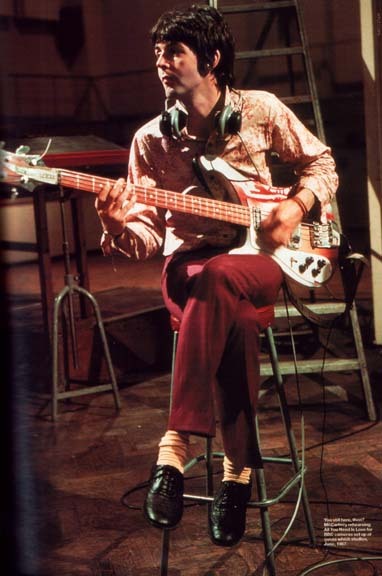 Over the next few years the group evolved into the Beatles, with Paul switching to bass. McCartney and Lennon agreed early on to share all songwriting credits, even though they directly collaborated on only a handful on songs; throughout the Beatles years "McCartney-Lennon" wrote and sang the vast majority of Beatles tunes. When all of the Beatles moved to London in 1963, Paul began to see actress Jane Asher on a steady basis.